Palliative Psychology provides unique and comprehensive training for psychologists specializing in palliative and end of life care. Chapters explore the complex, psychological needs of patients and family caregivers, as well as the knowledge, skills, and attitudes psychologists need to work effectively in an interdisciplinary palliative care setting. Psychologists will learn how to combine a therapeutic presence with the ability to provide patient- and family-centered, evidence-based assessment and interventions throughout the trajectory of illness. Focus points and numerous real case discussions complement each chapter. Palliative Psychology also addresses crucial professional issues, including communication and collaboration with health care providers and work stress. The text discusses how psychologists can best communicate the results of assessments and treatment goals to other care providers in order to better advocate for patients and family caregivers. It also highlights the important role of psychologists in helping other clinicians recognize and address work stress. Insightful and practical suggestions for professional self-care will help psychologists manage the emotional intensity of palliative care and enhance their work with patients and caregivers. 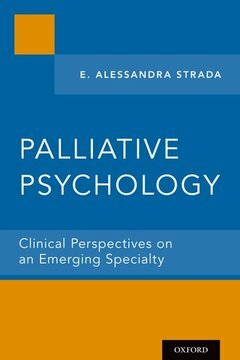 Dr. Alessandra Strada, PhD is a uniquely skilled clinical psychologist specialized in palliative care. Her unique breath of training and experience includes extensive work in evidence-based clinical practice, academic credentials, book authorship, and director-level experience in institutional organization and management. She holds a PhD in Clinical psychology, a PhD in East-West Psychology, a Post-Doctoral Masters in Psychopharmacology and a number of certifications, including clinical hypnosis. She has presented on palliative care nationally and internationally, and has developed and directed post-graduate trainings for palliative psychologists.